Tracie Bennett as Judy Garland. Photos by Carol Rosegg. Judy Garland played an important role in my childhood. I literally wore out my VHS of The Wizard of Oz, the 1939 hit with MGM studios that propelled her into stardom at just sixteen. And my family’s folklore has it that for weeks at a time I insisted on being called Dorothy. I don’t mention these childhood antics because I find them particularly idiosyncratic. On the contrary, Garland was so beloved for her portrayal of the Emerald City-bound, homesick Dorothy Gale, that I’m sure many others have similar stories of Dorothy-adoration or of fervent appreciation for one of her other iconic roles as America’s girl-next-door. Love for Garland herself was certainly palpable at the Guthrie’s opening of End of Rainbow. Written by Peter Quilter and directed by Terry Johnson, this show exposes the underside of so much intense public adoration by offering a glimpse into Garland’s private life during what would be a final run of singing engagements at London’s Talk of the Town in 1969. Often painful and hilarious, Quilter’s new play shows us a Garland who, haunted by her past success, struggles to maintain a glamorous exterior despite significant financial troubles. A performer since the young age of two, Garland arrives at this come-back engagement in London with conflicting desires. On the one hand she wants to prove she’s free of her various addictions. On the other hand she deeply believes these addictions allow her to continue performing. This internal conflict animates her relationship with Mickey Dean (Tom Pelphrey), her then fiancé who would become her fifth husband, and her rapport with her pianist Anthony (Michael Cumpsty). 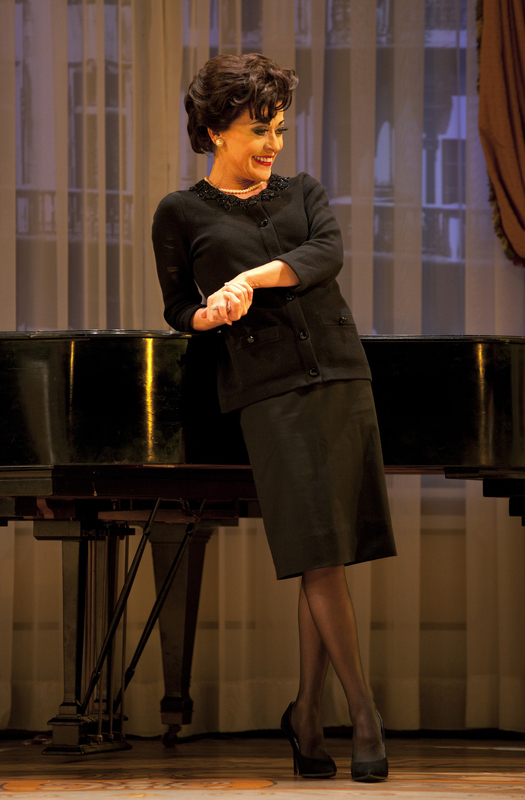 Tracie Bennett’s performance as Garland provides much of the show’s humor and sadness. Bennett, who first played the role last year during the play’s premiere in London’s West End, will continue as Garland during its upcoming run on Broadway. Indeed, it’s hard to imagine anyone else in the role, as Bennett not only captures Garland’s physique and mannerisms, but possesses an incredible voice. She belts out many much-beloved tunes like “I Can’t Give you Anything but Love” (Jimmy McHugh and Dorothy Fields) and “Come Rain or Come Shine” (Harold Arlen and Johnny Mercer), with a range and power that’s nothing short of stunning. Most impressive about Bennett’s performance, however, is how it transcends sheer impersonation and manages to add to our collective understanding of Garland’s public foibles and private difficulties. The set design by William Dudley highlights just how thin the divisions were between Garland’s public and private life. Transitions between hotel room and concert scenes happen quickly, with a surprising amount of overlap between the two. The physical juxtaposition of a big band and hotel room furniture is both imposing and effective. And the shifts between these scenes call attention to our complicity as an audience that both applauds Garland’s performances and witnesses the toll they exact behind the scenes. End of the Rainbow handles this question of audience engagement so deftly throughout the show that I was rather surprised at the tone and staging of an additional musical number following several well-deserved curtain calls on opening night. It’s certainly understandable that the audience wanted an encore from Bennett. And yet the decision to have her remain in character to deliver this encore struck me as strange. Over the course of the show we see Garland’s on-stage persona transform from a confident show-stopper with charismatic nervous energy, to a frightened former star who comes across as desperate and disoriented. What’s more, we see just how much Garland’s need for public adoration contributed to her addiction and death. Given what we’d just seen, it was jarring to have Bennett reprise the former persona in order to sing one more number, a number the audience duly adored. But perhaps this jarring coda was precisely the point. Even after all we’ve seen, some part of us wants Garland to sing some more. Still, I think this might have more been an opportunity to take a moment to applaud Bennett’s successful performance as Garland. If an encore we must have had, it would have been more fitting to have Bennett break character and sing as herself. End of the Rainbow by Peter Quilter. Directed by Terry Johnson. At the Guthrie Theater, 818 South Second St., Minneapolis, MN 55415. February 3-March 11. Guthrie Box Office: 612.377.2224 or 877.44.STAGE. Tickets may be purchased online at www.guthrietheater.org.